As a teacher with over 20 years experience in the classroom, my working life has been governed by planning lessons with clear structures, objectives, differentiating ideas appropriate to the individual, and taking students on a pathway to learning. Parallels with Rational Emotive Behaviour Therapy (REBT) immediately struck a chord with me; as an aspiring sport psychologist, here was an approach that enabled me to follow a plan; I could be organised and decisive amongst the wavering uncertainties of working with real-life clients. The fact that I could ‘teach’ performers, using REBT’s didactic approach, relating links between their beliefs and emotions using the ABCDE framework, seemed like an ideal match for someone with my teaching experience. As an educator, having a didactic personal approach sits comfortably with me, enabling me to provide a clear structure for athletes to work through. The goals of REBT are clear; to teach clients to identify, evaluate, dispute and act against their irrational self-defeating beliefs, helping them to not only feel better, but get better. Taking individuals along this pathway of learning through the ABCDE framework is directive, yet this systematic approach promotes flexibility in thinking. I have found this method of delivery to be popular with athletes; they comment on the simplistic nature of the framework and it’s ease of use. They are able to draw upon and apply the ‘ABC’ framework in moments of pressure in performance situations. Most notably in my experience is how this constructive approach fosters unconditional self-acceptance. This is where individuals learn to accept their adversities and adapt to them; so that when they do inevitably face an undesirable situation, they can react in a constructive way. In sport, this is a useful learning tool. Sport, as in education, is full of uncertainties; anxieties fuelled by feelings surrounding success and failure, unknown outcomes and ‘performances’ which can be stressful for athletes. Taking a more constructive path to thinking is a powerful new concept for some athletes. To date, my experiences using REBT with athletes have been very positive. I have witnessed changes in athletes, such as; teaching one to like oneself, to not take things too seriously, to realise that there is joy in participation, to realise that achievement requires effort and acknowledgement that one does not have to be perfect. These concepts can enlighten athletes to learn more about themselves and understand why they feel as they do. Enlightening athletes to decide how to use their newly acquired knowledge in the future is something I see as a key strength of REBT. As a practitioner, you teach individuals to learn rather than becoming dependent on going to therapy; it fosters independence and autonomous learning, a goal I am continually striving for in the classroom with my students. Helen finished her MSc in Sport & Exercise Psychology from Staffordshire University in 2016 and is currently completing Stage 2 training to gain chartered status as a Sport Psychologist with the British Psychological Society. 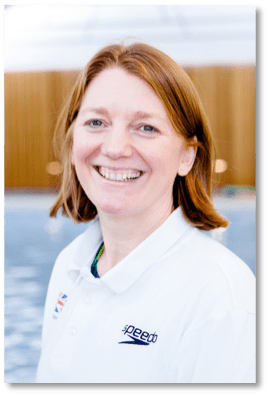 She is also a teacher, having spent over 20 years working in the classroom, and is a competitive Masters swimmer.